In the last few weeks, three new presidents have been inaugurated at our members institutions, and AICUO was represented at all three. 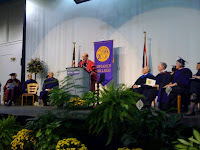 On October 8, Mark Gordon was installed as the 18th president of Defiance College. Todd represented the association by marching in the academic procession. In fact, the photo at right is of President Gordon immediately following his inauguration from Todd's seated perspective. For Todd, the highlight was the inaugural address. Next, on October 22, Kathy Krendl took the reins of Otterbein College as its 20th president, in the presence of two AICUO staff. Todd again represented the association, while Bob Burke, AICUO’s research director, represented his undergraduate alma mater, Harvard. Finally, Heidelberg University inaugurated Robert Huntington as its 14th president on November 6. Sadly, Todd arrived too late to march with the procession, delayed like others by a massive highway accident. Arriving just as the other representatives marched in, he had the opportunity to watch with what seemed to be most of the student body in the basketball arena’s stands. As one who attends many such ceremonies, Todd found the event to have some unusual touches. Most pleasurable was the inclusion of poems from Heidelberg Professor of English Dr. William Reyer, and from Dr. Susan McCafferty, who also happens to be the wife of the new president. Dr. Huntington's call fro strengthening the institution as institution strengthens the lives of its students and the community were well received among the undergraduates in Todd's bleacher section.